I can't get behind a farmers market cookbook that does't once mention chard- I just can't. This is an extremely California-centric cookbook. A lot of these items will never ever show up in farmers' markets elsewhere in the US, and the seasons that veggies are grouped in have everything to do with CA seasons. I couldn't believe how little emphasis there was on cooking greens. The recipes themselves looked ok (although they were very fruit-centric), but mostly they seemed basic and not original. A lot of them looked like what I throw together when I see what the CSA gave me and see what else I have in the house - no recipe needed. My husband just bought this book for me. The introduction is by Alice Waters and since he knows I like anything 'Alice Waters' he thought I would like this cookbook.It is all about fresh seasonal food prepared simply and nicely photographed. I'll be trying some of the recipes. Kind of over the top ingredients--wild boar, pomegranates, langostines--but very interesting recipes, arranged by season--and including some wild cocktails. 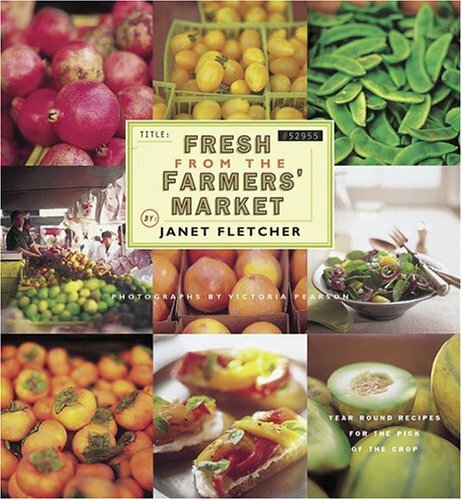 Janet Fletcher Victoria Pearson Alice Waters - Janet Fletcher, a columnist for the San Francisco Chronicle, is the author of numerous books on food and wine. She lives in Napa Valley.